At the European Federation of National Organisations Working With The Homeless in Dublin Castle this morning. 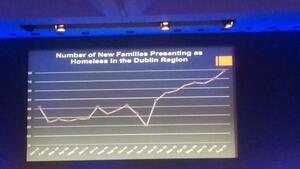 Clear spike in presentation of families to homeless services in Dublin. But what about that dip? 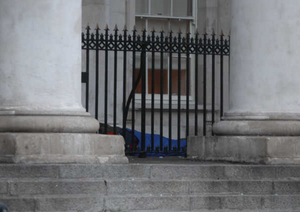 Readers may recall how, following the death of Jonathan Corrie close to the Dáil on December 1, 2014, emergency accommodation was set up in the Civil Defence headquarters at the Esplanade, Wolfe Tone Quay, Dublin 7. Readers may also recall how, in late January, Rosie Naughton, from Hope4Homeless, spoke to a homeless man called Richie in Dublin. Richie told Rosie that it was his understanding that the emergency beds, rolled out in the wake of Jonathan Corrie’s death, would be removed over the following two to three weeks. 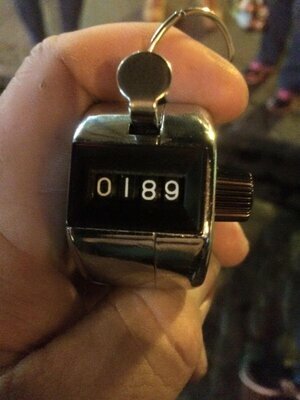 Richie told Rosie he was told this by the Simon Community, Focus Ireland and Merchant’s Quay. 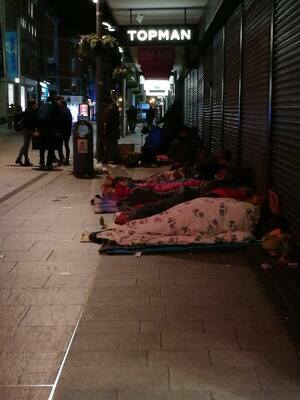 Posted in Misc and tagged Dublin, Homelessness at 10:54 am on September 25, 2015 by Broadsheet. all of the extra one-night only beds are still in operation as far as i know. 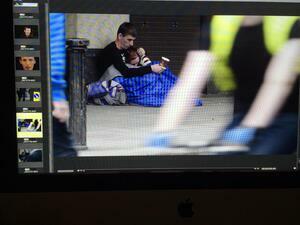 is there confusion here regarding the cold weather initiative beds? they come on stream when ground temperatures hit 0, usually around november till february/march. Nice job on the Y axis you complete morons. No wonder this problem keeps getting worse.